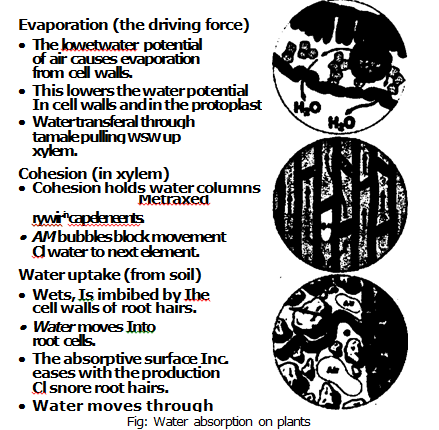 WATER Absorption: of water*, root hairs: . [he absorption of \safer from the soil takes place tlitimigh the root hairs. Ihe root hairs are in contact with the wateriilms on the soil particles. ‘[here is a thin lining of cytoplasm inside the root hair. This cytoplasm encloses a large vacuole filled with cell sap. The Cytoplasm and cell sap of the root hair are continuous with the root cell. The cell %\ all of the toot hair is a permeable membrane. water passes into semi permeable cytoplasniic membrane by osmosis. Thus it removes film of capillary water from soil particle. It draws films of water from the adjacent soil particles. This process continues and water moves from considerable distances to the root hairs. This movement of water takes place due to cohesive forces between water molecules. The root hair cell absorbs water and becomes fully turgid. Therefore. its osmotic pressure fall and its turgor pressure increases. So the suction pressure of adjacent conical cell increases. Thus it pushes water into cortical ccIlS. Passage 9f wafer through endodermal cells: Water passes from root hair cells to the cortical cells. The endodermal cells have Caspariait. strips. They offer resistance in the flow of water. Theregte. water pissds through endodermis by symplast pathway. Secondly. :the endodermal cells opposite To the protoxylem do not have thickenings. 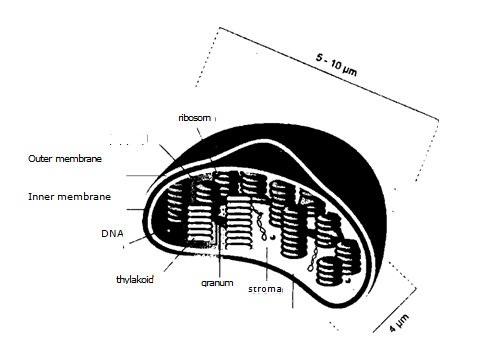 These are known as passage cells. These cells allow the movement of %sitter across the endodermis from the cortex to the protoSylem. Then water passes through pericycle and it finally’ reached at elements of the xn lent. helps in the absorption of water. I he force which water is drawn. in from the soil depends. upon the difference between the osmotic pressure of xnlein sap and the soil solution. Root pressure: Water is Forced into the xylem vessels by the surrounding cortical cells w ith a certain force. this induces a pressure w Inch raises the water to many feet in the xylem. This pressure is called root pressure. Root pressure is responsible for the phenomena of bleeding and guttation. There are many typos in this lecture. One can’t even understand the sentence.